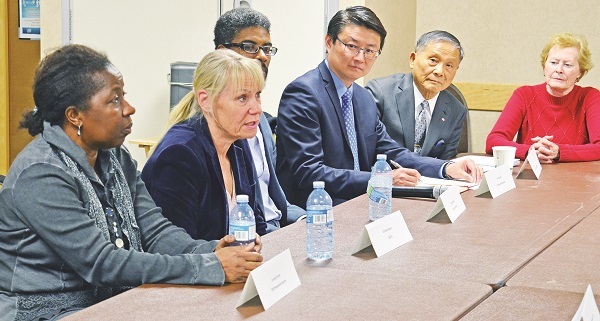 Allowing seniors to age in place – and remain active while doing so – were central issues voiced to Canada’s Minister for Seniors last week at a roundtable hosted by Newmarket-Aurora MP Kyle Peterson and the Aurora Seniors Association. Representatives from the Aurora Seniors Association (ASA), Newmarket Seniors Meeting Place, CHATS (Community & Home Assistance to Seniors), the Canadian Association of Retired Persons (CARP), York Region Makers, 108 Health Promotion, the Region of York, along with Mayor Tom Mrakas and Newmarket Mayor Tom Taylor were among those who gathered at the Seniors’ Centre last Monday to outline their concerns to Filomena Tassi, Federal Minister of Seniors. The stakeholders went on to press the Minister on the issue of affordable seniors housing, which was something both Mayors said was important to Aurora and Newmarket as a whole. “We are very aware of this in terms of the need for affordable seniors housing,” responded the Minister. “You are not just talking about housing, but transition pieces where people can stay, making sure it is age appropriate or age friendly, etc. In Budget 2016, we invested $200 million and that was to create a minimum of 6,000 spaces for seniors in terms of affordable housing. Then, subsequent to that, $40 billion in the national housing strategy. In that strategy is what there is a co-investment piece and I believe that is $16.5 billion. That is the application that can be made to apply for safe, secure affordable housing for seniors. It is a minimum space of 7,200 if you do a number count, but it can be a lot more than that. Aging in place, she added, was another component the Federal government was taking to heart. $6 billion was given to the provinces and territories, she said, to support seniors who want to age in place, but there is still work to be done creating spaces ideally suited for seniors. But the Federal government needs to make more advances and headway on transportation, said CHATS CEO Christina Bisanz. Ms. Bisanz said she was encouraged by the Minister’s agreement that transportation was an issue right across the country, particularly in more rural areas, including those here in York Region. Organizations have applied for grants under the New Horizons program to forge transportation services to get seniors from place to place, an initiative that is very much in CHATS’ wheelhouse. “We are very appreciative of the support we’ve had from the New Horizons program,” said Ms. Bisanz, offering that program grants received by CHATS have not only enabled them to install a wellness garden at their Edward Street headquarters, but also seniors technology labs in Aurora and Richmond Hill. These programs, she said, help seniors stay connected, staving off feelings of isolation, but much of their client base is “the more frail elderly” who are not able to get themselves from their place of residence to the program. Providing the means for seniors to get where they need to go is just one component of helping them stay and age in their homes as long as possible, live independently and do so in dignity. But there is also a vital need for human resource supports to help people age in place, she added. Home care is becoming ever more important and is, in many cases, the preferred option to help seniors age in place. “The challenge we have is we have already hit a wall in terms of…resources in the personal support area. It is increasingly difficult for any of us, whether it is home care, long term care, hospital care, to be able to attract and retain personal support workers,” she said, asking for something to be done “from the standpoint of immigration” for a national strategy on health and human resources, focusing on skilled support workers and nurses.